As summer moves into gear, why not take to the water to unwind and enjoy a calmer pace. No one living in the region can be unmoved by the beauty of Lake Léman, Western Europe’s largest lake. 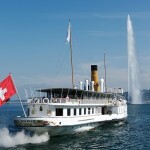 Taking one of the six Belle Epoque boats is a wonderful way to get a new perspective on the Lavaux region, cruising from Ouchy to Vevey or the Chateau de Chillon. The vines planted on their steep terraces form a criss-cross patchwork that changes from brown to green as the seasons progress. 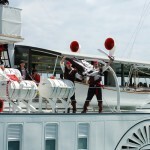 If you tire of the scenery, the well-oiled gleaming mechanisms of the paddle steamers are mesmerizing to watch. As well as being able to get from A to B on a boat, you can also enjoy dinner or lunch prepared by Michelin-starred chef Philippe Chevrier. On Friday evenings in winter and spring (till mid-June), you can enjoy a fondue cruise (cheese or Chinese fondue). Taking a boat trip on any of the country’s lakes is delightful. Moving in the other direction, you can admire the flower-decked quays in Morges, stop off in Nyon at the flea market on the last Sunday of every month, duck across the lake to the medieval village of Yvoire where you can enjoy a slap-up lunch in French style, or sail by Geneva’s famous Jet d’eau. There are great family offers available – two adults and two children can travel all day for as little as CHF 49 with a half-price rail card. Between the extremes of Léman and Constance, Switzerland seems to go in for lake clusters. 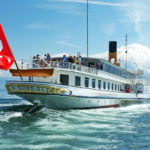 The Three Lakes area in the northwestern part of the county is home to Lakes Neuchâtel, Biel and Murten, which offer interconnecting boat travel and free bicycle transport so you can get some exercise as well. 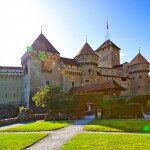 In the middle of the country, you can set out from Interlaken, the town literally “between the lakes” of Thun and Brienz, which are distinguished by their stunningly contrasting colours – blue in Thun and turquoise glacial water in Brienz. With 60 or so sizeable lakes (and 1,500 in total), Switzerland offers a wealth of opportunities for sun basking, cruise and water-lovers. So what are you waiting for?